The weibo message was later pulled, giving even more food for thought. In the next few hours it managed to get nearly 1,000 replies, but if true this might mean that an even earlier launch for the US market is possible. It's still however just a rumor, but it might be an indication for the prospects of iPhone sales. While China is currently the second largest Apple market in the world, Cupertino is selling to only a fraction of its hundreds millions of mobile subscribers. But the iPhone is facing a number of difficulties in China, a market where localization matters a lot. China Mobile for once operates a TD-SCDMA 3G network, unique to the country and not compatible with current versions of Apple's handset. So currently users have to actually use the 3G offerings from China Mobile's top competitor, China Unicom, which in turn requires them to change their number. China Unicom first started selling the iPhone 4 in September 2010. 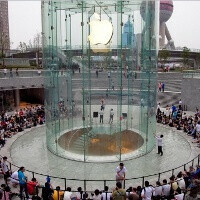 Recently, Apple COO Tim Cook was spotted at China Mobile, which hints that a deal might be closer to completion. The carrier's official media representative denied comments for the press, but confirmed that the carrier is in talks with Cupertino and will gladly offer LTE-equipped iPhones when those are available. Who cares. Timbaland ain't been dope since "big pimping". Wp7 is pure trash.